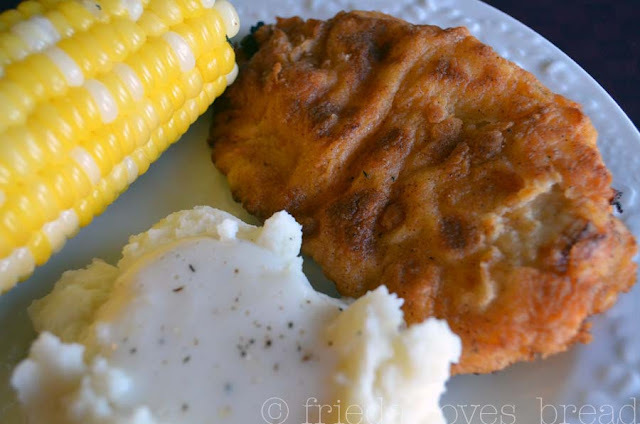 This recipe comes from the Deals to Meals blog, and it is pretty darn tasty. Every Sunday, my mom would either cook up a pot roast or fry up some whole chicken. The only things I would change are to reduce the amount of garlic powder (2T.) and cut the flour mix in half, as I had quite a bit left over. I used 3 boneless, skinless chicken breasts and cut them in half length-wise for 6 (1/2" thick) pieces, total. 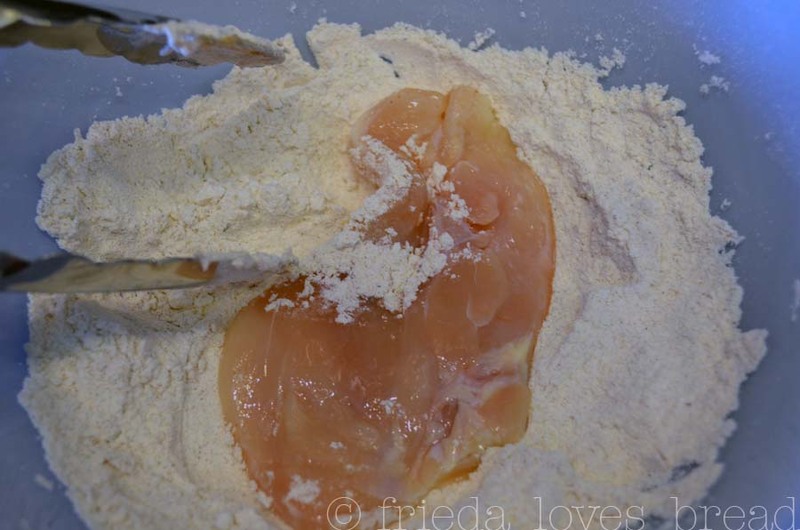 I find this method of cutting the chicken to be easier and less messy than pounding the chicken. I marinated my chicken in the buttermilk, although the recipe doesn't call for it. 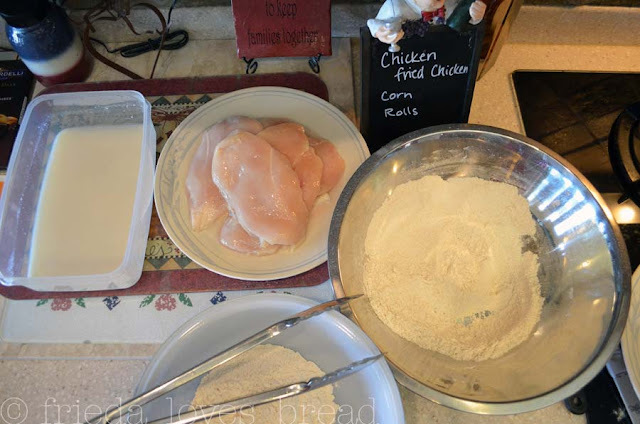 Dip the chicken pieces into the flour, back into the buttermilk, and into the second bowl of flour mix. Tongs are very helpful to use, unless you want to batter coat your fingers! Allow the coated pieces to sit for 5 minutes before cooking ... uh, er ... frying. After all the chicken is cooked, I mean fried, it's time to make the gravy. 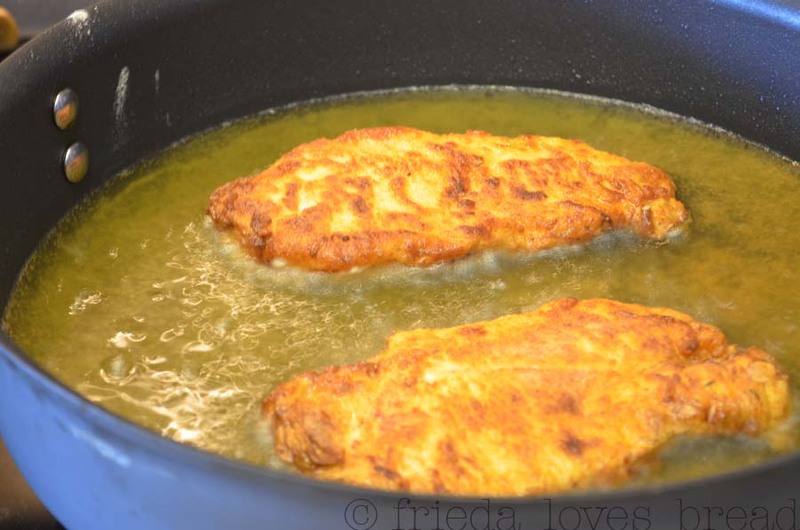 Take 2 Tablespoons of the oil from the chicken skillet and mix in 3 Tablespoons of all purpose flour. Stir and cook over medium heat for a minute or so to cook out the raw flour taste. Deals to Meals pours their milk slowly, while whisking to avoid a lumpy gravy. 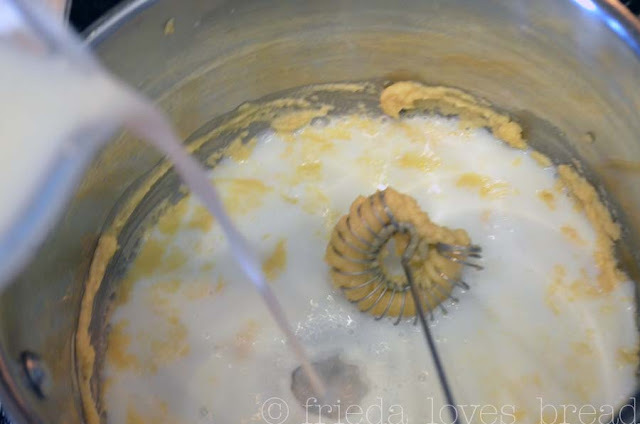 I pour mine all at once and quickly stir ~ stirring continuously until the milk/flour mixture is completely dissolved. 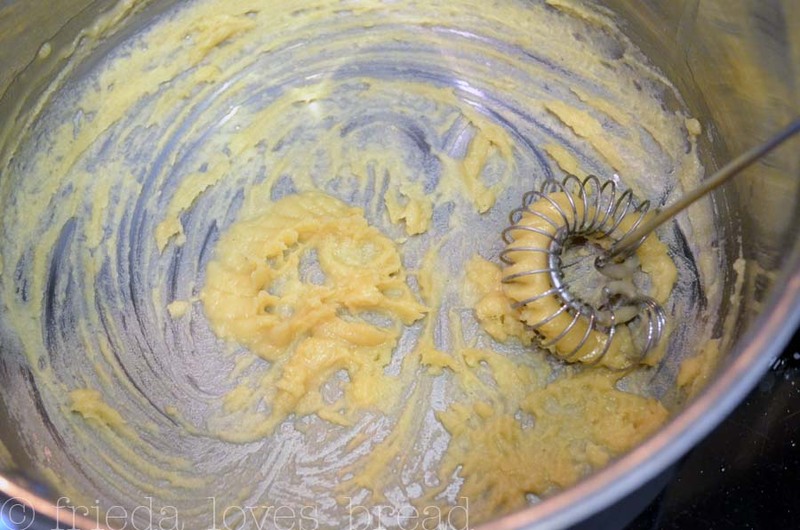 What is important is that you dissolve everything before heating it up to thicken it. It will take about 5 minutes on med-high to get it to thicken. A perfectly fried piece of boneless chicken, with mashed potatoes, gravy, and grilled corn on the cob, makes a fine Sunday meal! 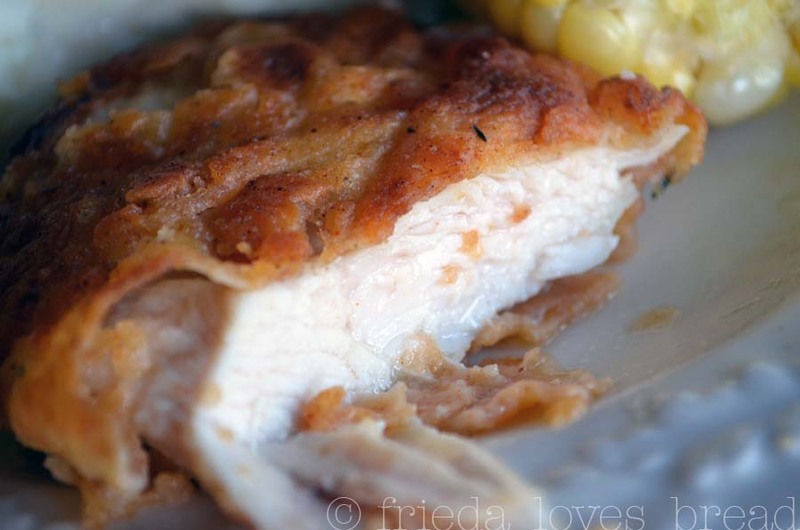 Hi Freida, this looks like a nice dinner, I make this gravy too and we love it. This is GORGEOUS, as I'm sure I will feel after eating it. Thanks, Freida. That looks soooo good. You take the best pictures to capture all the juicy goodness. Mmmm...comfort food at its best.